Marketing is a necessary evil in home sales. Whether retaining existing clients or acquiring new ones, agents must consistently work to generate new business via networking and advertising. 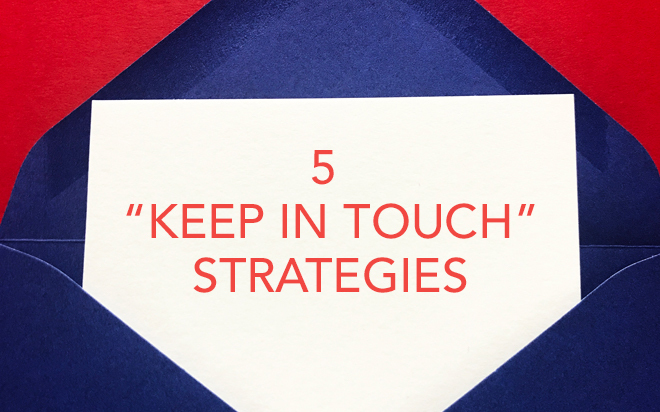 And while social media has certainly changed the world around us, one of the most popular marketing methods continues to be direct mail postcards. That being said, designing a postcard that stands out from the competition isn’t always easy. Effective postcards take careful thought and effort. Are you having trouble separating yourself from the competition? 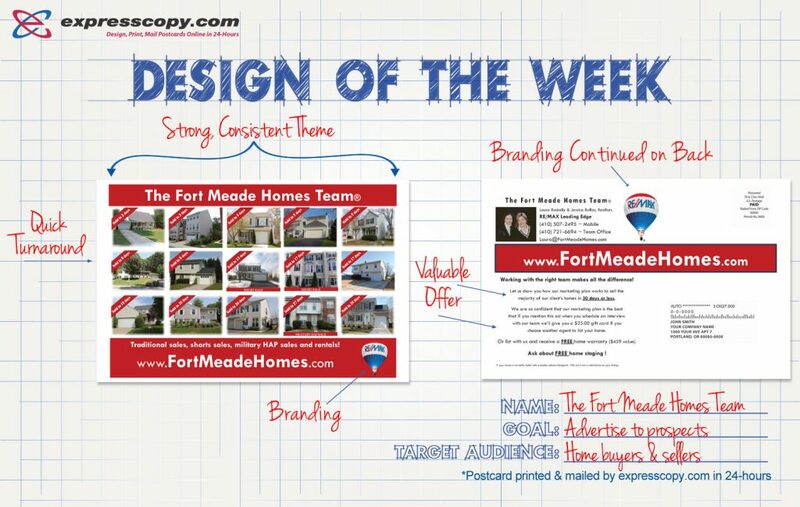 Below are 5 examples of super effective postcards and the qualities that help them standout. Let’s face it. The average American receives a lot of junk mail. Which is why designing a postcard that stands out is so vital when conducting a direct mail campaign. 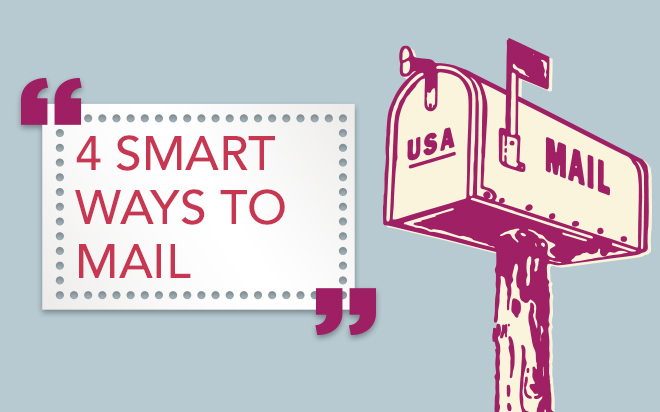 One way to design a postcard that stands out is to use vibrant colors, interesting fonts or striking images. 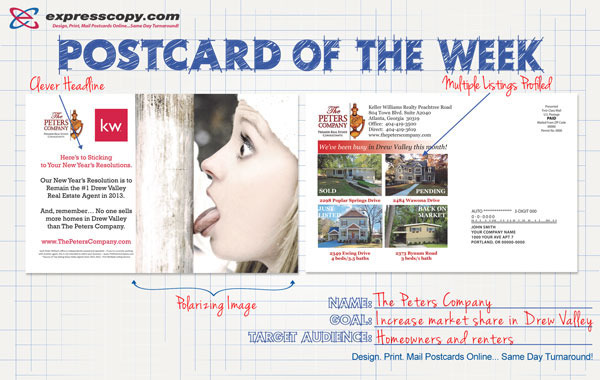 The postcard above not only makes the most of a unique image to nab the attention of potential clients, but implements a strong white/red color contrast with a clever headline. Creative. Compelling. Effective. Potential clients can’t act if they don’t know anything about you. Information is vital. Did you just list a home? Did you just sell a home? What kind of properties do you specialize in? 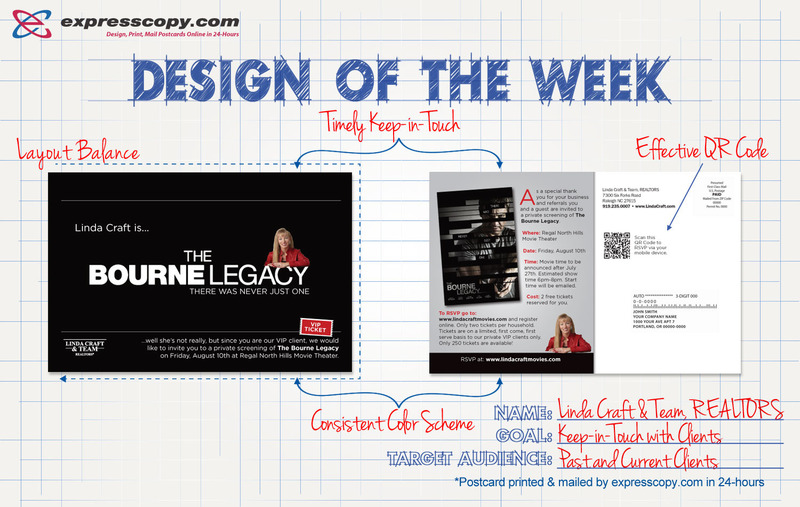 All of this information should be effectively conveyed on your direct mail postcard. The postcard above not only specifies homes that have just been sold, but how fast they sold! In addition, the postcard maintains a strong, consistent theme, while making a valuable offer on the backside. Unless you are keeping in touch with past clients, don’t assume potential clients already know what area of real estate you specialize in. Inform. The importance of brand consistency can’t be overstated. In the world of real estate, brand consistency not only conveys stability to potential clients, but provides a foundation from which to build a larger marketing strategy. Do you have a catchy saying you like to use? Certain colors? A logo? Indeed, there are countless ways to create and sustain a brand. Sometimes it depends on your target audience. Other times it depends on your company. Whatever the case may be, always strive to be creative and remain consistent. 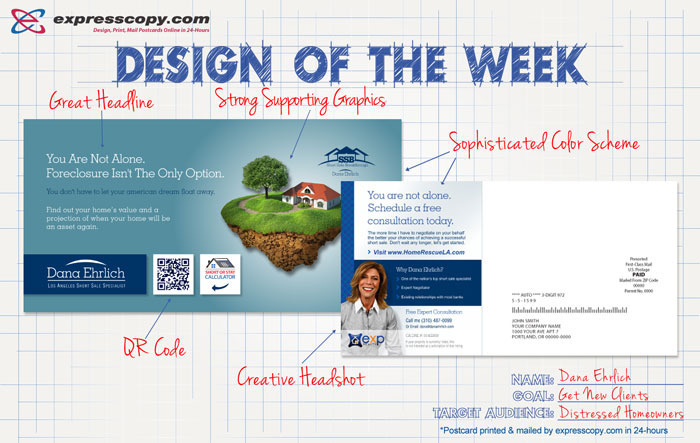 In the example above, the postcard reinforces its brand on both sides with consistent logos and colors. Likewise, the photographs and green layout compliment the logo, sustaining a strong outdoor theme. Simple is always better. But while taking a creative approach can certainly be beneficial, you also run the risk of pushing away potential clients when you don’t show restraint. The idea is to strike the perfect balance. Not too much, not too little. Be innovative but don’t distract from important information. The postcard above manages to do both. The agent not only invites past clients to a special movie screening each month as part of her keep-in-touch strategy (a very creative idea, by the way), but does so while avoiding clutter and maintaining a very simple, sophisticated design. Is there anything digital technology hasn’t impacted? The real estate business is no exception. Depending on your willingness to adapt and try new things, however, taking a new approach isn’t necessarily a bad thing. More than ever, digital technology has allowed real estate agents to reach out to potential clients in new and innovative ways. In the example above, a QR code is prominently placed on the front of the postcard, allowing users to scan the code with their phones and receive more information. What are you doing to embrace modern technology? We offer a few ideas here if you don’t have any. In today’s bustling business world and cluttered real estate market, standing out is vital. However, standing out doesn’t always mean complicated layouts and fancy fonts. Sometimes it simply means thinking outside the box, being innovative with what you have and embracing emerging tools. 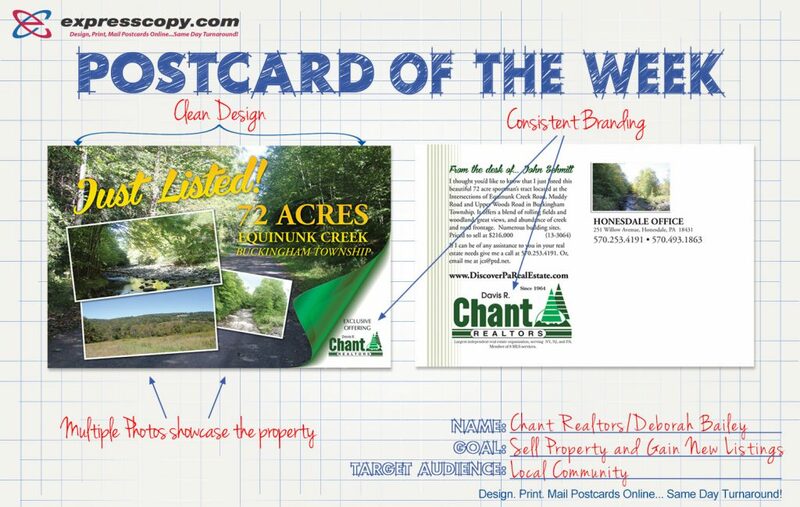 For a comprehensive breakdown of more super awesome postcards in the future, visit our postcard of the week section at our blog.